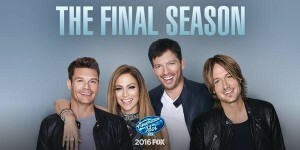 American Idol SPOILERS: The series finale airs on April 7. Check out a photos and videos of YOUR favorite alums rehearsing for the big day. UPDATED WITH THE SOUL PEEPS! Eliminated in 4th place, American Idol 15 finalist MacKenzie Bourg talks about Rock Week, releasing “Roses” as a single, and more. American Idol Top 3. You watched the singers perform, now take the polls vote for fav solo and duet perfomance, who will be eliminated? American Idol 2016 Recap Top 3 – After Top 4 Hometown visits, ONE contestant is eliminated. Watch for performance VIDEOS. Scott Borchetta has more to say to Taste of Country, including revealing the Top 3 format and gushing about Trent Harmon. More right here. American Idol 15 Song Spoilers – Top 3 – See the List! American Idol 15 Power List: Mac and MJ rank the remaining Top 4 ahead of the Top 3 performances and results. Who are your favs? American Idol Top 4 singer Trent Harmon headed back to Amory MS (3/26) for a hometown heroes welcome Check out videos and photos of his visit. American Idol Top 4 singer, Dalton Rapattoni headed back to Sunnyvale TX (3/26) to a hometown hero’s welcome. Videos and photos of his visit.